One of my favorite book series is the No. 1 Ladies Detective Agency series writted by Alexander McCall Smith, a Zimbabwe born, Scottish writer. The stories are set in Botswana, the country to the North of South Africa, and the lead character is a traditionally built Botswanian woman, Mma Ramotswe, who, assisted by her bright secretary, Mma Makutsi, sets up the first and only detective agency in the country run by women. They solve the problems that are brought to them using a combination of womanly intuition and insight, backed by advice from the fictional Clovis Andersen's book The Principles of Private Detection and many many cups of African bush tea. The books make a wonderful read not only for the entertaining plot lines but also their emphasis of principles of life, love and happiness. They always make me smile and feel good about life! Anyway, the reason I brought that book up is that it was the first thing that came to my mind, when I saw Meeta's Monthly Mingle theme. This month, she suggested we dabble in South African cuisine and tell her about it. 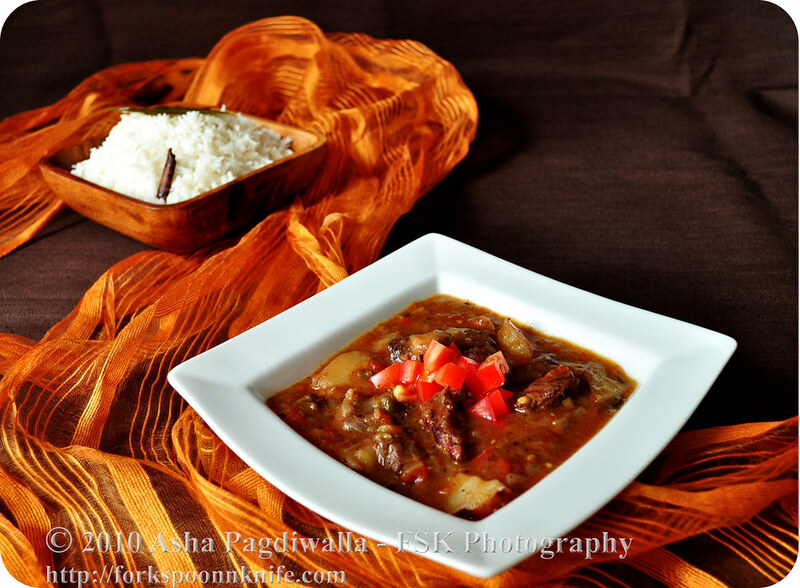 I remembered this book and some of the mouthwatering meat stews that are mentioned in the book. Botswana is South Africa's neighbour and I thought that there must be shared cuisine. I wanted a stew reminiscent of Mma Ramotswe's cooking. When I came upon Tomato Bredie, it struck a chord and I decided that would be my choice of dish for a taste of the bush lands of Southern Africa! "Bredie" in Afrikaans means "stew" and derives from the Portugese word "bredo", used to describe boiled greens. Presumably, the term and the dish were introduced in the region by Portugese sailors. 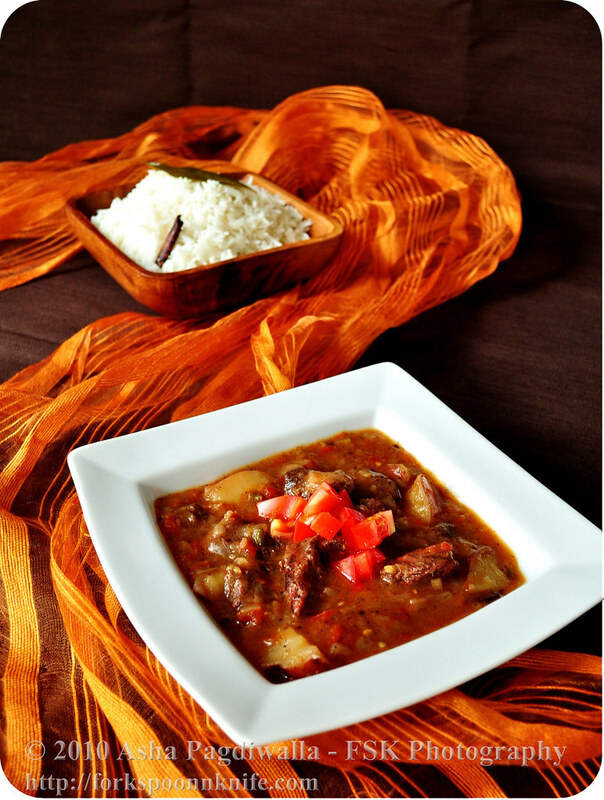 The stew is usually made with mutton spiced with cardamom, cinnamon, cloves, ginger and chilli and served with rice. Verdict: I cannot sing enough praises about it. It was wonderfully flavorful, rich and so satisfying. I served the bredie with aromatic rice using the same whole spices as were in the bredie, accentuating the flavors beautifully. I had also marinated the meat overnight in a marinade of ginger, five spice powder and salt. 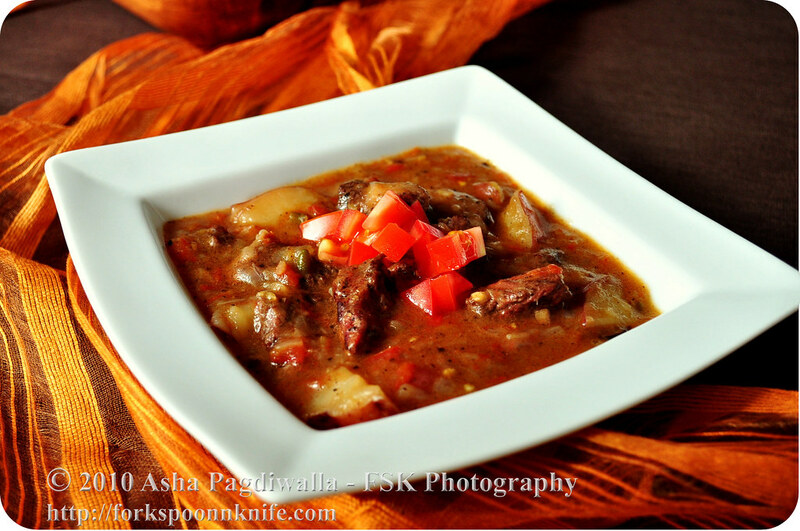 This really helped flavor the meat itself and break down the protein resulting in a very tender and juicy stew meat. The previous night, coat the meat pieces with the marinade and massage into the meat. Cover and refrigerate overnight. You can leave it in for 24-48 hours. To make the stew, roast the cloves, cinnamon, whole peppercorns in a little bit of oil. Once they start to release their aromas, add the onions and saute until browned. Add the meat along with ginger and cardamom and brown all sides of the meat. Cover and let simmer for 15 minutes. Add the tomatoes, chilli, stock, salt and pepper and stir well. Cook for five more minutes. At this point if you are using a pressure cooker, add the potatoes as well, transfer to the cooker and let is steam for 3-4 whistles. If not, continue cooking until meat is almost done. Then, add potatoes and simmer until they are tender. When the stew is cooked through, melt the butter in a small pan and add the flour to it. Cook for a minute and then add the roux to the stew to thicken. Serve over hot aromatic rice (below) and some fresh diced tomato. In a little bit of oil, roast the spices until they release their aromas. Add the rice and salt and roast for a few minutes until evenly coated. Add water, cover and boil until all the water has evaporated and the rice has been cooked. Gently, fluff with a fork to ensure even seasoning.